I am kind of glad you bought this up because A Jack is only for the lifting part of the Task Then we have to stabilize the load, Once raised the Jacks work is done until the Vehicle has to be lowered and we tend to think that the Jack as the be all and end all and when we do that that's when it all goes wrong. I Own 3 High Lift Jacks, One is a copy and the 2nd is the Genuine 48" HL-485 and because I found that on Lifted Vehicles or uneven ground I needed a taller version so I bought the 60" Extreme Hi-Lift. The one time I needed one in the field (North Africa) I used two on ththe back of an 88 to remove a cooked diff. The ring gear itself broke in my truck. I pulled the half shafts and drive shaft and drove “front wheel drive” for a couple days. We were in a parking lot and were able to secure parts via taxi in short order. As varied as peoples views are about Hi-Lifts I have used mine for a lot of things not just on the Truck, from anything from fixing up horseboxes/floats to pulling stumps and fence posts, A Hi-Lift is a Great problem solver. I bought a few pieces from their 8ton jack extension line as I carry an 8ton bottle jack for changing flats on trailers and my large tired 3500. They are very well made and significantly safer than using the jack alone. No affiliation but I have one if the safe jacks with the jack stand. I found that for the Land Rover LR4 it is the safest way to jack the truck through the air suspension travel. It does require using the jack stand to adjust the height of the bottle jack but it secure, stable, and feels safe. I love hi-lifts for their flexibility and agree with 67cj5. To me their worth is much more than just jacking a vehicle. But like any tool it has limitations and needs to be used wisely. You cant escape the danger associated with weight and height. I've seen the cable version TernOverland mentioned (online not in real life) and the stability of the top of the jack should bring a high degree of safety. I think alot of people get in trouble because the jacking point of the vehicle doesnt always grab the "point" of the hi-lift well so slips etc become more likely and dangerous. Safe Jack's also makes a product for bottle Jack's which provides a series of extensions and a "cradle" like top which can hold an axle tube or whatever. Also makes a lot of sense so your bottle jack is safer to use. I think something like this could be made pretty easily ($270 seems pretty expensive). Just dont depend on safe jack to change a flat as it will not fit under the axle on most vehicles when flat. I carry a selection of SafeJack jack adapters for my Hummer H1 scissors jack. The H1 jack has a big knob on top to engage the control arms on the H1, so that makes it almost useless for other vehicles. 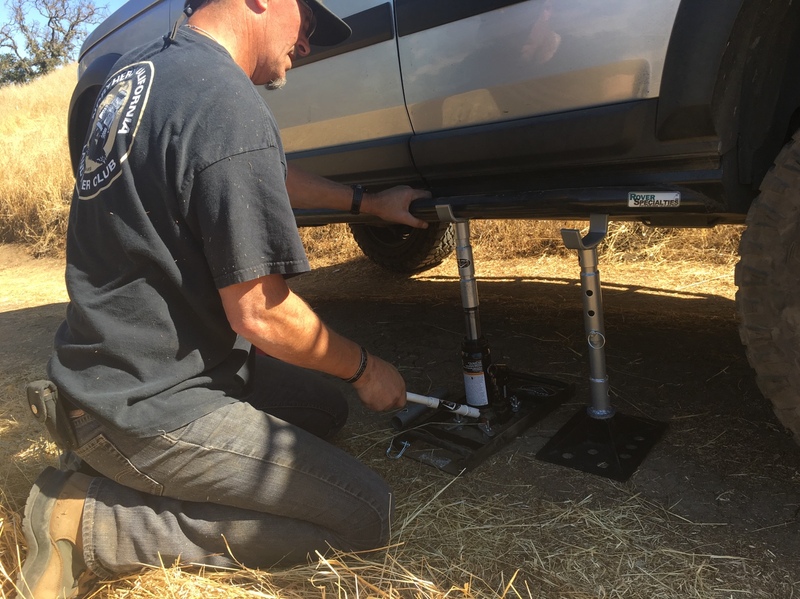 However, the SafeJack adapters allow use of the H1 jack with just about any vehicle, and the H1 jack cranks down to something like 5" height. The H1 jack knob is about 1" OD and the SafeJack adapters are a little bigger than that, so I slipped short lengths of thinwall aluminum tubing into the adapters to stabilize everything. I also carry a Hi-Lift and (usually) a Bushranger X-Jack. This is in response to the above comment about something similar could be made fairly easily. This is a correct statement providing one has the equipment and skills to DIY. I made this kit after looking at the safe jack pieces (and prices). A friend and I worked together and made them only for ourselves. I would never consider making these pieces to sell. Version two of the base board. This provides a bit more stability but I may still invest in the safe jack base. I can’t say I’ve used these with the jeep except as an extra hand, nothing off road. When I was putting together my shop after the last move I used them as a helping hand quite a bit. Over the years I have worked out a few was to use jacks and Hi-Lift Jacks, If I can't get a normal jack under there I will use the Hi-Lift to raise the body enough IE jacking off the Tow Hitch but not taking the Vehicle off the ground and then putting the Bottle or scissor jack or Trolley jack under there so it is just taking enough weight so it can't be pulled out and then remove the Hi-Lift and then raise the vehicle and if the ground is good then placing an axle stand under there, It's a long winded why of doing things but some times a Hi-Lift is not the right tool and some times it is. Don't use the jack it a straight vertical position, you want the Base slightly inwards towards the truck compared to where the Top is because as the Jack raises the Vehicle the jack will lean towards the vehicle, If you place the Jack perfectly vertical as it lifts the Truck it will then lean at an Angle towards the truck and then as you raise it more it will be leaning up to 6 to 8" towards the truck That's when it is about to slip off the Jack, SO first line the Jack up perfectly vertical and then Kick the Base in by about 3 to 4 inches and when you have jacked up the Truck it should be just about perfect. I found this out when my van had a blowout. I had to get a shovel out and clear out some dirt in order to get the jack low enough to use. I now carry an H1 jack with the Agile Offroad adapter in addition to my Safe Jack.